Over the years, we’ve had the pleasure of working with some amazing institutions like The Gates Foundation, edX, Arizona State University, Elsevier, and even some amazing people, like Fabien Cousteau! And in that time, we’ve learned a thing or two about what it takes to succeed as an edtech company. But what many people don’t know is that one of the keys to success is our very own Paul Mumma! He has been nominated to join a panel at SXSW Interactive next year and speak as an expert to the intricacies of business development in the edtech business. We’d love your support in making that opportunity a reality. Please spread the word and vote for our panel at—http://panelpicker.sxsw.com/vote/47659. Education is a unique industry and one where the contemporary tech ideals of disruption and rapid, iterative pace of development are often at odds with the more measured and entrenched traditions of academia and its layers of bureaucracy. To compound the issue, starting an edtech company is not for the casual or short term entrepreneur (read why here). For most attendees in the SXSW Interactive crowd, these truths run counter to the majority of the startup dogma that’s preached on a daily basis. To succeed in edtech, you truly have to play by different rules. For mission-driven companies, the opportunity to have meaningful and transformative effects on education outweighs the challenges, but passion alone can’t drive success. 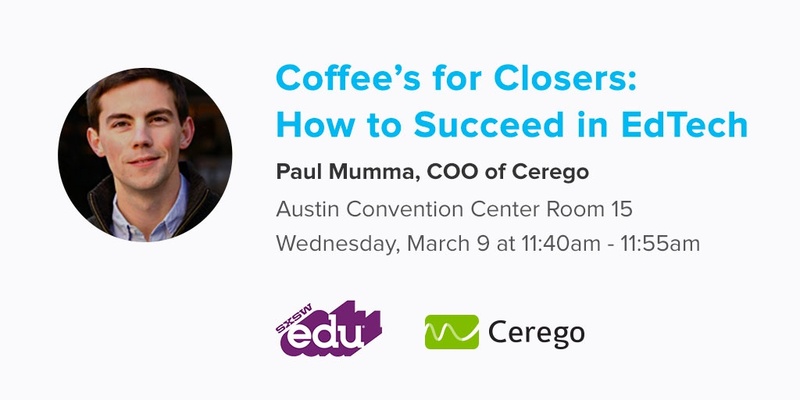 In this panel, Paul plans to join two other successful entrepreneurs as they discuss how to tackle the business behind the blackboard: how to close deals, strike necessary partnerships, and develop long-term strategy for your company. It will be a rare event where panelists will show their cards and explain their strategies and tactics. At Cerego, Paul is the director of operations. He studied at University of Oxford and Harvard and consulted with McKinsey & Company before joining Cerego to transform online education. He will not disappoint! Please help us make this panel a success. Vote now, and spread the good word. Thank you for all of the support! Next Post Three cheers for Cerego 3.0 for iOS!